To achieve authentic photography it is important to condense emotions. Pictures that tell a story have a certain expression, a clear philosophy and a special visual language. These images are not irrelevant or created by chance. They have a clear right to exist because they represent something particular. They often pinpoint what other pictures fail to do: an emotion, an event or a unique moment. There are many ways for a photographer to create such images. 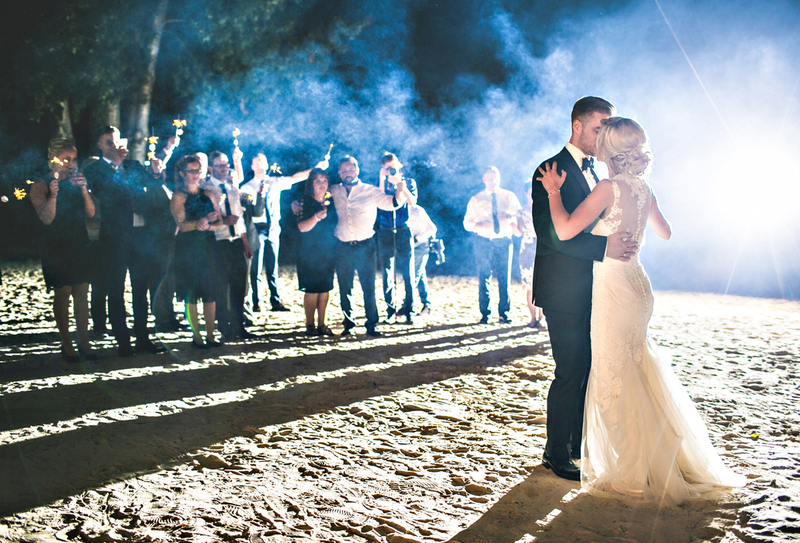 Visual language is especially important for wedding photography. I would like to share 3 quick tips for a stronger visual language that carry my business from the beginning. To document an event authentically you should not just be an observer from the outside. It can be beneficial to engage with the crowd and win their trust by conversation. The less you are perceived as a stranger, the more open people become and act natural around you. This makes it easier for you to search and find special moments! Personality based marketing can provide trust in advance and help customers get an impression of you. Human branding sounds complicated but it merely describes a way of marketing that focuses on your personality and commonalities with your target audience. You should be able to answer principles like: „What drives me and what do I stand for?“, „How do others benefit from my work?“ and „How am I emotionally connected to my customer?“. If you can answer these questions and apply them to your work it will have a positive long-term impact on your visual and corporate language: your expression improves and your brand becomes unique. You will make a genuine impression and make more emotional pictures. Zoom less, move more! I like to be close to people and to get there I use my feet. If I find an interesting situation I move closer to it. Thus I have a direct experience and not from the distance. I love to sympathize and celebrate with my client. I can anticipate a moment before I photograph it because I pick up all the emotions around me. Closeness enables people to open up in my presence. Tip 1 however is more important since I need to open up at first before I can expect the customer to. Since day one I exclusively use prime lenses which helped me to photograph more consciously. If I cannot simply zoom into a scene I have to consider timing and focal length in advance. This mighty be challenging at first (which is good!) but gives you confidence in choosing the right lens for the right situation. Don’t get me wrong, I do not oppose zoom lenses! However I believe we learn especially well when we are forced to actively move to get a better framing and perspective. 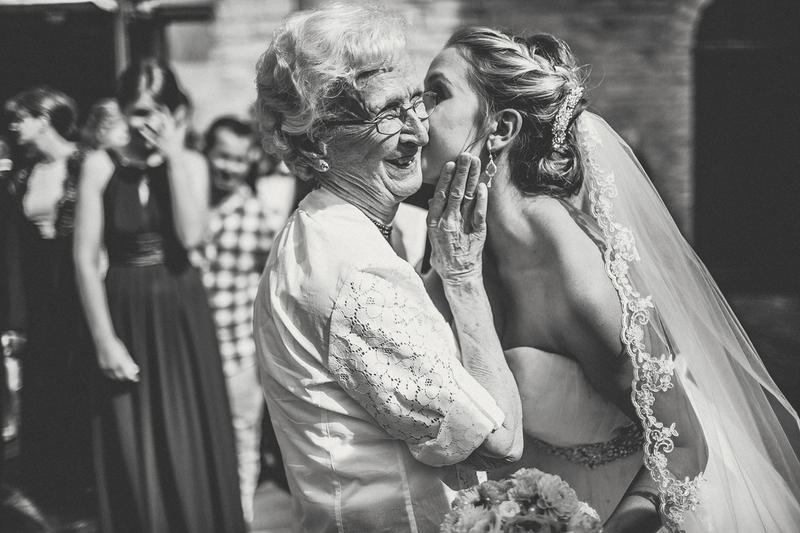 Taking photos is a holistic process, and personal contact improves it even more! The subject of this image might be „grandpa Carl and his granddaughter“. You should ask yourself what a picture should contain or exclude before taking it. Grandpa Carl and his granddaughter are a good example. It would be even better if your picture expressed an universal subject. It should be relatable to those who don’t know people in the image by using a comprehensive theme. How about: family, love, solidarity, generations, strength, joy or sadness? There are many emotions that concern us all. The key to touching pictures is to condense a moment (timing/framing/perspective/lighting) so it can become a universal theme. 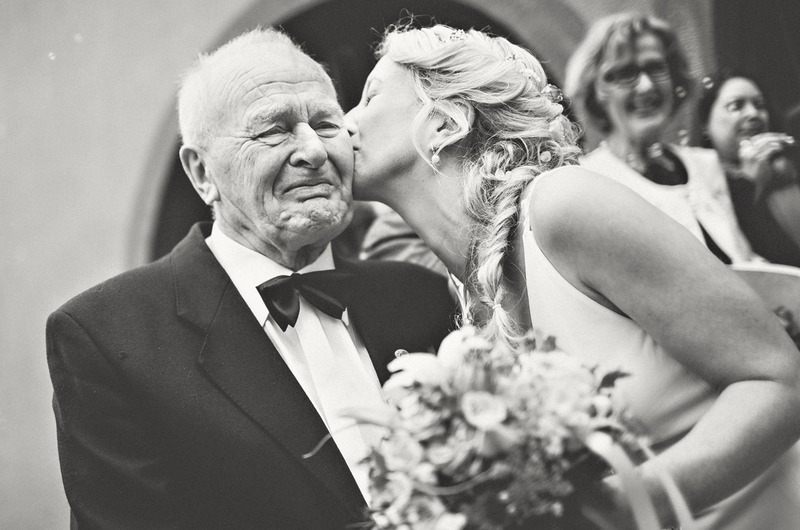 Thus an image of grandpa Carl and his granddaughter depicts family ties and pride. It takes patience, good timing and vigilance to capture moments like these. For that reason I am rarely far away from the crowd: I have to be alert to catch special moments. You have to be ready at all times to adjust your camera instantly. Preferably your camera is prepared before a situation takes place! Make yourself familiar with your hardware. The wedding itself is not the right place to troubleshoot. Practice beforehand and learn to handle your camera in a matter of seconds. It is an extension of your eye and should not prevent you from getting the best picture of the day. By the way: I think it is very important not to overload pictures with information. I try to eliminate any distractions in my images. Ask yourself consciously: how do I support my theme and what deviates from it? This might be a disturbing background or disturbing shapes and colors. Disruptive factors lurk everywhere ;)! It is essential to confront yourself with these questions. Conscious photography is the key to strong images. Determine a theme and create a picture accordingly. Keep asking yourself how to draw attention to things you want to highlight. You can achieve this by using certain lenses, aperture, lighting or framing. Setting a universal theme before pushing the button will result in a stronger visual language. We are all connected by relatable subjects. You have your very own concept of family, love and themes that concern humanity. Be an artist and let yourself influence your vision of love. What is love for you? What does childhood and family ties mean to you? This is beneficial to consider if you are going to photograph couples and families. Within you lies a giant source of inspiration. Once you start, those who share your views will come to you naturally. This is your ideal customer, people you can look forward to work with. Text and images shown here are subject to copyright of the author. To learn more about outsourcing of image editing please click here. This entry was posted in Photography and tagged quicktips photography, visual language, wedding photography. Bookmark the permalink. ← Speed up your Lightroom export!